For those disappointed by TRENDnet's TPL-421E2K first HomePlug AV2 MIMO adapter kit [reviewed], redemption is at hand. To cut to the chase, the TPL-421E2K Powerline 1200 AV2 Adapter Kit with Built-in Outlet has the performance the TPL-420E2K should have had, and it's only around $10 more for the kit of two. You can also buy individual TPL-421E adapters, but at around $55 a pop, you'll pay a premium. The TPL-421E is fairly large as powerline adapters go. At 61 x 123 x 65 mm (2.4 x 4.8 x 2.6 in. 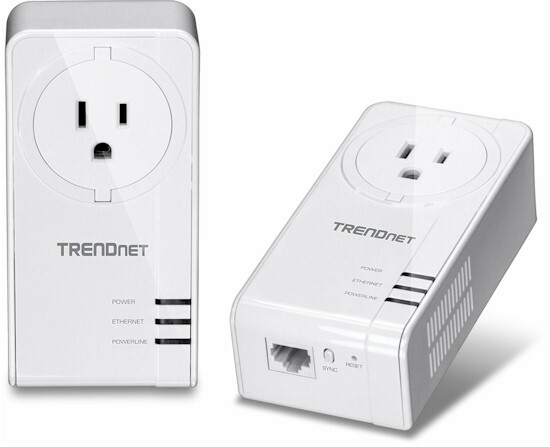 ), it's sized more like NETGEAR's PL1200 / PLP1200 than its smaller TPL-420E no-outlet sibling. As large as it is, the 421E won't block the second outlet in a U.S. grounded duplex. The callout diagram below shows the adapter supports tri-color HomePlug link quality indication. The single Gigabit Ethernet port is on the bottom side of the adapter, with the Sync button and reset button hole next to it. The User Guide says the adapter goes into power-saving mode "when there is no network traffic for more than 10~20 minutes". I found it was more like three minutes for power save to kick in. This was tested via the following procedure, which ran without a hitch. The TPL-421E uses Qualcomm's QCA7500 HomePlug AV2 MIMO IC. Check the PLA5405 review if you'd like to see the device block diagram, or just download the data sheet. The 421E's inside photo shows the QCA7500 at lower left. That's an Atheros AR8035 Gigabit Ethernet PHY right above it. There is no separate analog front end (AFE) device; that function is built into the QCA7500. This board is plugged into another board below it that has the wall plug and mostly passive components. The 421E didn't get very hot during testing, despite its lack of heatsinks. The large ventilation slots on both sides of the device appear to keep it cool enough. It also helps that components aren't jammed into a tiny box. Here's a fuzzy view of the unplugged board underside showing 128 MB of Samsung K4B1G1646G RAM and 4 MB of Macronix MX25L3206E flash. TRENDnet includes a Power Packet Utility on the CD packed in the 421E2K's box. You can also download it from the product's support page. It requires WinPcap 4.1.3, which will also be installed if it isn't already. The screenshot below shows the Utility, which doesn't expose the incomprehensible QoS controls some other powerline utilities do. The screenshot was taken with both adapters plugged into the same power strip, showing a 910 Mbps link rate. I was transferring a large sequential file when this screenshot was taken. Printing out the utility's report showed the identified the adapter firmware as MAC-QCA7500-2.0.0.382-05-20150511-CS. You can also use the utility to set the encryption key (aka password) if you don't want to use the pushbutton method. I tested the TPL-421E using our standard powerline test procedure, with all results entered into the Powerline Performance Charts. I included two other top-ranked AV2-MIMO adapters, NETGEAR's PL1200 and TP-LINK's TL-PA8030P-KIT and the 421E's TPL-420E2K no-outlet sibling. The Downlink Throughput plot below shows the TPL-421E having the highest throughput in the best-case same-outlet Location A, but in no other test location. Top throughput in Locations C and E was produced by TP-LINK's TL-PA8030P-KIT. Uplink results show the same relative performance results as downlink. The simultaneous up /downlink IxChariot plot for the TPL-421E at Location A shows higher average downlink throughput after an initial position swap. The 523 Mbps total throughput result was 17% higher than 446 Mbps Location A downlink result. I'm showing the composite downlink IxChariot plot because the Location A trace was so flat and maximum throughput was an even 500 Mbps. I asked TRENDnet whether this was expected behavior and they said it was within the range of what they've seen. Adding more simultaneous streams adds a bit more bandwidth. With two up/downlink streams running simultaneously, total throughput moves up around 8% more to 565 Mbps vs. the single up/downlink test. Average throughput is fairly evenly distributed for three out of four connections. Location E is where most of my worst powerline noise sources (our smartphone and tablet chargers) live. The Noise tests basically plug and unplug a particularly noisy wall-wart while an IxChariot stream is running and compare the results to a stream with all noise sources unplugged. The composite plot below compares the baseline Location E downlink test, run with all noise sources unplugged with a run with the noise source plugged in then uplugged at the 30 second mark. Throughput recovers to the maximum no-noise-source value within a few seconds, just as other AV2-MIMO products do. I saw a thread in the forums from someone who said they saw powerline throughput reduced more than 50% when something was plugged into an adapter's passthrough outlet. So I ran a simple test. The top line in the plot below is downlink throughput in Location E with no noise sources plugged in. The _plugged_into_adapter.tst line is the same wall-wart noise source used in the test above, plugged into the 421E's pass-through outlet at the receiving end of the connection. Because the signal level from the transmitting adapter is lower at the receiving adapter, noise will have the most effect. But the plot shows the basically the same throughput as the no-noise-source top line plot. The _no_remove.tst line shows lower throughput when the same wall-wart is plugged into an outlet on the other side of the same room. My conclusion: the 421E's pass-through outlet does an effective job of noise filtering. There has been a lot of jockeying for #1 position in the Powerline Ranker of late among AV2-MIMO adapters. And it looks like we have a new #1 with the TPL-421E2K the latest product earning our Ranked #1 award for AV2-MIMO Powerline performance. As you look at the Ranker Performance Summaries below, remember the numbers don't change, but relative rank does as new products are added to the Charts database. While the 421E2K earns only #1 sub-rank, it edges out the TP-LINK TL-PA8030-KIT by having two #2 subranks vs. the TP-LINK's two #3 sub-ranks. But if you're looking for the adapter most likely to provide higher throughput at a distance, it still looks like the TP-LINK holds an edge for downlink throughput only.